The Shrine Gardeners would like to encourage you and your family during the month of May, which is dedicated to the Blessed Virgin Mary, to take time to visit the Shrine, decorated in white which is the liturgical color of Easter, and use as an opportunity to renew your own and your families devotion to the Mother of God. We hope you enjoy your visit and will stop back when the gardens are in full bloom for our upcoming Open House. We are a group of parishioners who volunteer their time and talent in the ongoing beautification of the Shrine area. 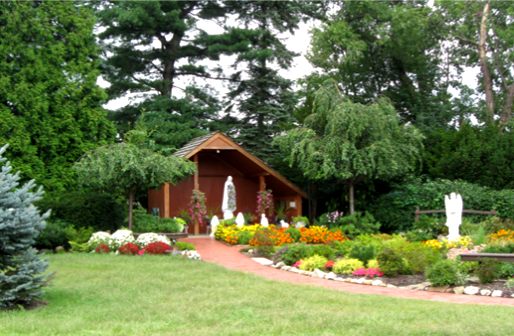 We weed, trim, mulch, plant and maintain the area around the Shrine of the Blessed Mother. We need gardeners, landscapers – people who enjoy the outdoors and working with plants and flowers. This is a win – win ministry. You become part of a team of dedicated people who are proud of their parish and are willing to add a helping hand in it's appearance. You also share in a special dedication to the Blessed Mother. We'd like to thank all those who purchased an engraved brick paver over the last few years. This project was a tremendous success not only as our main fundraiser but as a special way to commemorate our loved ones.